This easy mousse is a great way to let any citrus fruit shine, but it's particularly delicious with Meyer lemons or blood oranges. Combine lemon juice, cream, yogurt or sour cream, condensed milk, and vanilla in the bowl of an electric mixer fitted with a whisk attachment. Beat on medium-low speed until the cream foams and forms soft peaks when you turn off the mixer and lift the whisk. Stir in the lemon zest with a spatula and refrigerate for 30 minutes or up to 2 hours. Scoop into bowls and serve with the garnish of your choice. 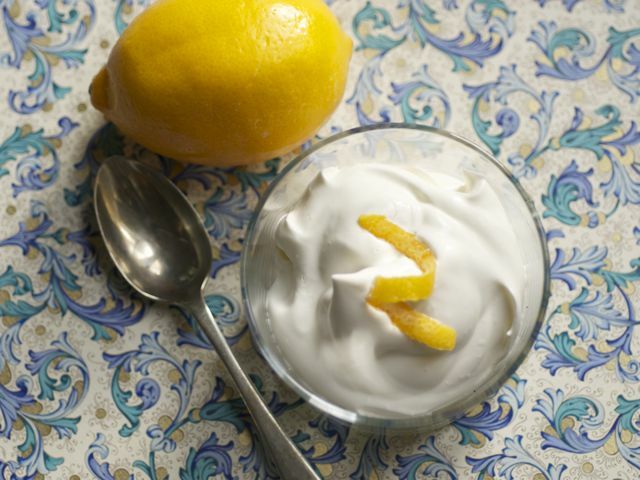 Total (a Greek brand of yogurt made by the Fage Company) is the best option for this dessert. It's available at most supermarkets, but if you can’t find it, substitute sour cream instead. If you're wondering what to do with your extra lemons, read Helen Rennie's column on how to use citrus.